888-LOG-GUYS is your one-stop shop for all of your log home needs! We have a wide range of services within the Sewanee Tennessee area, log home restoration, log home repair, log home chinking and caulking, log home improvement, and log home maintenance. We know how hard it can be to find a reliable and professional company to help you take care of your log home or log cabin. If you just stumbled upon our website, it’s no coincidence! Look no further! We’ve got you covered! 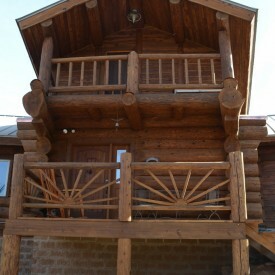 We offer a variety of packages for our customers to restore the grandeur of their log home or log cabin. Our services include media blasting (corn cob, glass, walnut, or sand blasting), sanding, borate treatment, energy seal (chinking or caulking), and staining. You can trust us to make your home look and feel as good as new. We will not stop until you are 100% satisfied with our work! Call our number or request an estimate from our website! If a log is not properly protected, it can be severely damaged by rot. Birds and bugs can also find their way in, causing problems with the safety and security of your log home. If you have experienced such problems, call 888-LOG-GUYS to help! We know how to repair or replace those old and rotten logs to bring your log home to the best condition it can be. Don’t delay! Make sure your log home or log cabin is safe and secure with the best in the business! Is that white line in between your logs starting to crack? Or do you see gaps in between your logs that need to be filled? Call 888-LOG-GUYS for an application of energy seal (chinking or caulking)! You can also request an estimate online. Keep out what is suppose to be out and keep in what is suppose to be in. Prevent air drafts, water leaks, and bug invasions! Let our crew take the stress from you and keep your log home comfortable for you and your family! If you have dreams for your log home or log cabin, call us and give us the opportunity to help make your dreams come true! 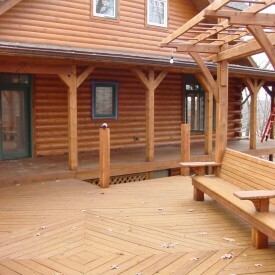 We have built decks and porches, log staircases, log railings, and other additions to increase the value of the log home. The improvements we make for you will also increase how personal the home is for you. So, go ahead! Add that deck or log railing! But first ask for an estimate from 888-LOG-GUYS so that we can do all the hard work for you! If you are not sure when your log home is due for another treatment to keep it in top-notch shape, don’t guess! And don’t wait! Call us or request for an estimator online to help you figure out when your home will be in need for some more tender loving care! Using 888-LOG-GUYS as your log home maintenance company will save you time and money! Our crew is ready to come out to you and work so that your home stays in great condition!